xoxo, Jen: One Cotton Ball to Remove Them All! One Cotton Ball to Remove Them All! Yes, you read that right! I'm going to share my secret with you of how I remove a full manicure with only one jumbo cotton ball. The trick is to create more surface area. We're going to do that by unrolling the cottonball so that its a strip and no longer a ball. You'll notice the rolled up ball looks like a hay bale or roll of toilet paper. So, I kind of pick and pull around the rolled edge (like I would a roll of toilet paper!) until the end starts coming loose. Then gently unroll it the rest of the way. Next, cut ten strips from it to match the size of your nails. We're going to cover each nail with these pieces. 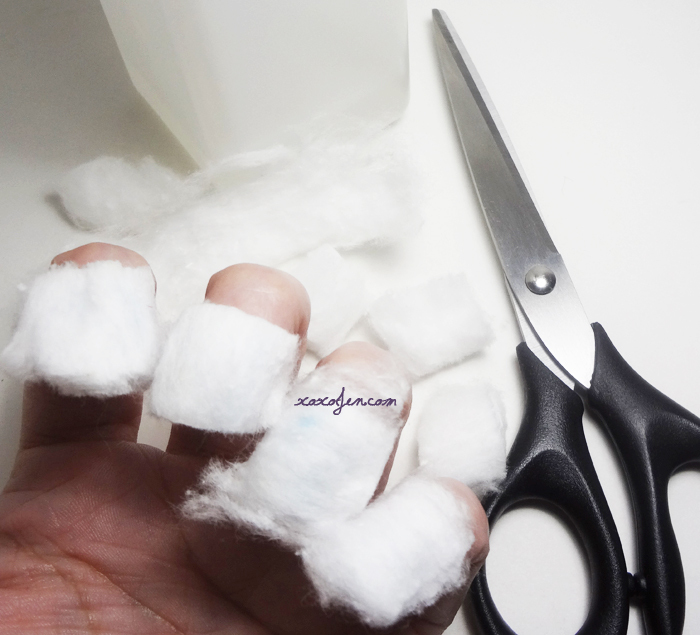 If you have small nails and make careful cuts, there may even be a tiny cottonball leftover! Once the ten pieces are cut, soak them with 100% acetone one by one and apply on top of the nail. 3. Using a pump bottle, which is the way I prefer most. It's less risky of spills/drips and can be done with one hand. Apply the soaked cotton pad to the nail and let sit for a bit. Five minutes is a fair time frame for a couple of layers of cream polish. Let it sit longer for more layers or polishes with shimmer. 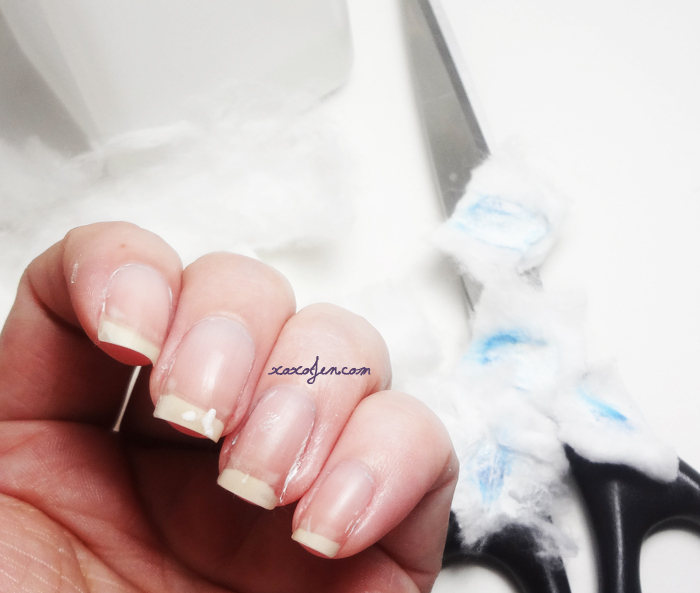 Remove each piece by pressing down near the cuticle and sliding the cotton to the free edge of the nail. This will remove most if not all of the polish. Above is my result! I had about three layers from my previous mani. Afterward, I used the tiny cotton ball remnant and removed the little spots of leftover polish. This method is very similar to the foil method, but without the foil. I've come to love the unrolling technique that I use, it is key to making a bag of cotton balls last much longer. I hope you find this useful and try it out some time! What are some of your your tips and tricks to remove polish? Awesome to see it worked so well for you! Hehe! Now all I need is a trick to save cotton for stamping plate cleaning. oy vey! Hmm... I wonder if it would work well to pull the layers apart into two pieces and then cut them into the strips? Something to try perhaps! ohhh do tell! Which brand do you like best? oh thank you! I'll keep an eye out for those - I love a fluffy cotton ball! Lol - try it sometime! You may be surprised at the result - plus that means money saved = more polish. yes?